Having returned with its new retro-tinged single “Woowa,” the DIA girls revealed that they had to get used to the new song, which was a whole new challenge for the group. “When we first heard ‘Woowa,’ we tried to deny our reality, as it felt so new and awkward to us,” said Eunice of her first impression of the new single during the act’s media showcase for its new album “Newtro” in Seoul on Wednesday. Fronting the act’s fifth EP, “Woowa” perhaps marks the most drastic shift in the band’s sonic style, which previously revolved around the band’s signature pure, mysterious bubblegum sound. Produced by Shinsadong Tiger, the song is scattered with retro-flavored rollicking quirky beats and synth sounds, emphasizing DIA‘s “girl-crush” image. “But after listening to it a couple more times, we got really into it, and thought the song was very energetic,” Eunice added. The album’s title, which is a combination between “New” and “Retro,” reflects the act’s attempt to reinterpret the vintage sound in the most classic way. The single marks DIA’s first record since its release of “WooWoo” in August last year. The members went on to share that the choreography for the new song, the most intense since the group’s debut, was challenging as well. “While practicing the dance moves for ‘Woowa,’ we used to say, ‘We will naturally lose weight doing this,’ and I had even cried during practice, as it was so difficult for me,” Huihyeon said. Yebin chimed in, saying she also got a lot of bruises on her knees while practicing the dynamic dance moves. At the event, DIA was also asked about the ongoing rumors about the possible departure of Jenny, who is sitting out on the group’s promotion for “Newtro” for her knee injury. 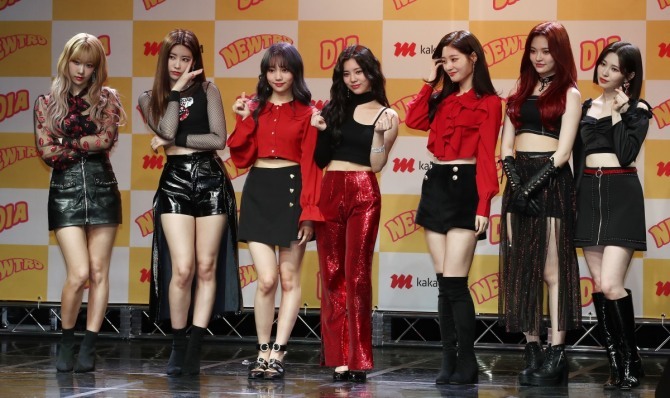 Having already released its new album a day ahead of the media showcase, DIA unfortunately failed to see its new song enter real-time streaming charts. But said it won’t be obsessed with the ranking. “All we hope is the song climbs up the chart gradually. We’d actually felt confused with ‘Woowa’ at first, but it got imprinted in our minds as time went by. If our audience could feel the same way, we will be satisfied,” Jueun said. The five-track album also includes “Five Minutes” and “Crescendo,” composed by Jueun and Yebin.